Shopping Stadsfeestzaal offers around 40 shops distributed over four levels in the heart of Antwerp. Its mix of amenities includes fashion shops, leisure activities and food & drink establishments, all accommodated in a unique combination of historical and modern architecture. Included in the retail outlets are a few “firsts”: the first Saturn branch to open in Belgium, the first Urban Outfitters to locate in continental Europe, a pilot store for Tommy Hilfiger and the first COS shop to open in Antwerp. At the end of the 19th century, Alex Van Mechelen, Antwerp’s City Architect, was asked to create a large banquet and exhibition hall in the heart of the city. The Antwerp Stadsfeestzaal thus opened on 22 June 1907. It was used for all kinds of festivities. After years of intensive use, municipal authorities thought that the hall had to serve a new purpose. 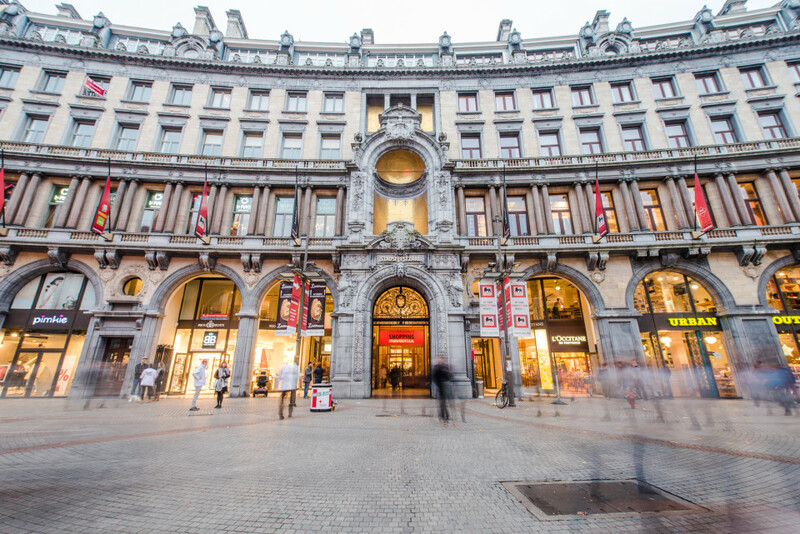 As part of the Mercurious Project intended to upgrade Antwerp’s shopping circuit, the City of Antwerp signed a contract for the complete restoration and integration of the Stadsfeestzaal. But in December 2000, a fire destroyed practically the entire venue. The only elements remaining were the steel roof construction, the concrete structure of the historical stairway, and the historical facades of the building. As a result, the redevelopment schedule was greatly delayed. In October 2007, Shopping Stadsfeestzaal finally opened as a unique project offering housing, shopping and leisure activities.